In an age of networking and conference attending, “un-conferences” have become quite fashionable, and one in particular has been gaining loads of attention: Summit Series is an experimental events company that serves a collection of artists, entrepreneurs, activists, philanthropists and musicians in an effort to make our world a better place. The idea for Summit Series began on a 19-person ski trip at Utah’s Alta resort in April 2008. Since then, founder Elliot Bisnow and his 15-person full time team (along with dozens of part-time staff) have put together events like DC10 and last year’s Summit at Sea, which gathered over 1,000 attendees including Sir Richard Branson, Peter Diamandis (X Prize Foundation), Peter Thiel (The Founders Fund), Blake Mycoskie (Tom’s Shoes), social media blogger Gary V and artist Peter Tunney. Attendees at Summit at Sea were asked to collaborate with leading scientists, explorers, and conservationists to understand and address the challenges facing our current oceanic ecosystem. The Summit Series cruise ship anchored just twenty miles from the 70 square mile South Berry Island Marine reserve, which is one of the most ecologically diverse areas in the Bahamas and was named a marine protected area (MPA) a decade ago. While this particular MPA has been declared a no-take zone, meaning there is no fishing of any kind allowed, it’s a sanctuary only in name. There was no infrastructure, not a single enforcement, officer and no protection. In many parts of the world, particularly China, shark fin soup is a delicacy, explains Summit Series‘ Chief Reconnaissance Officer Thayer Walker (who’s also an adventure journalist). “It’s a tasteless soup that’s a vanity item. And it’s very expensive. With the growing wealth and middle class that China has seen in the last several decades, shark fin soup has become widely prevalent.” Walker tells me that sharks are among the most threatened marine animals worldwide. Approximately 70 million sharks worldwide are killed every year just for their fins. One year after Summit at Sea, the Summit Series team has recently returned from a scientific expedition to the South Berry Island Marine Protected Area, capping a year-long ocean conservation campaign that raised more than $800,000 to protect the vital marine habitat. Expedition “Tiger Shark” was a collaborative effort between the Waitt Institute, who offered their research vessel, The Nature Conservancy, University of Miami R.J. Dunlap Marine Conservation Program, who conducted shark research and MacGillivray Freeman Films of IMAX, who sent a film crew. 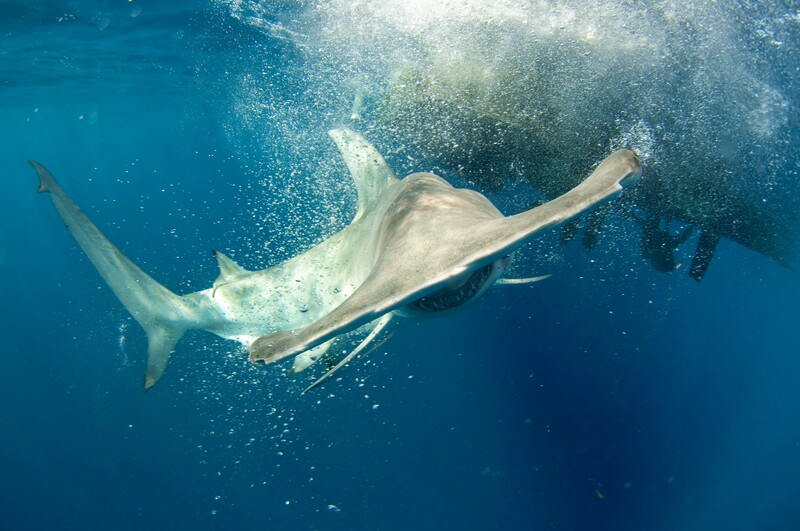 The teams spent 6 days studying the shark population of the South Berry Island Marine Protected Area. While many touted the trip as a boozey schmooze cruise for entrepreneurs, it’s clear that the Summiteers’ dream was fulfilled. Walker tells me that The Nature Conservancy believes they can leverage another $200,000, topping the fundraising effort to $1 million. The money will be used to open office space, set up an operational team, order special buoys to demarcate the protected area and to conduct the first shark research in the MPA. When I asked Walker if this would be enough cash to sustain operations to protect the area for years to come, he tells me something quite amazing. “At this point, The Nature Conservancy will use the resources to get everything up and going. See, they’ve always had enough money in their budget to keep it going, but they never had enough seed money to set it up,” he says. Walker describes the 6 days he spent down in the Bahamas clipping shark fins and why it’s important to do so. “The fin clip tells us what the shark is eating, and how healthy they are tells us a lot about the health of the ocean. We can also tell where they’re mating, giving birth and feeding. This allows us to isolate these hotspots and protect them in order to have the greatest impact,” he explains. And in true Summit Series form, Walker relates this method to Author Tim Ferriss‘ theory of the 4-Hour Work Week. “It’s all about maximizing results with the least amount of effort,” he says. Ferriss contributed $25,000 to the campaign. Check out this video below from their expedition. In it you’ll hear the story of Dr. Neil Hammerschlag and his friendly tiger shark named Berry. Oh, and in case you were still thinking of all the small-minded folks eating shark fins, recent research shows that has discovered high concentrations of BMAA in shark fins, a neurotoxin linked to neurodegenerative diseases in humans including Alzheimer’s and Lou Gehrig Disease (ALS). Sometimes nature has a way of working itself out. Want to know more about Summit Series? Read all about their recent Basecamp event here.